Also serving communities of Clarendon Hills, Willowbrook, Burr Ridge. There are 29 Assisted Living Facilities in the Hinsdale area, with 2 in Hinsdale and 27 nearby. The average cost of assisted living in Hinsdale is $4,750 per month. This is higher than the national median of $3,346. Cheaper nearby regions include Westmont with an average starting cost of $4,290. To help you with your search, browse the 233 reviews below for assisted living facilities in Hinsdale. On average, consumers rate assisted living in Hinsdale 5.0 out of 5 stars. Caring.com has helped thousands of families find high-quality senior care. To speak with one of our Family Advisors about assisted living options and costs in Hinsdale, call (855) 863-8283. The quiet village of Hinsdale, Illinois, is home to two National Register Historic Districts that give it an old-fashioned feel despite its location just 20 miles from downtown Chicago. Two assisted living facilities are located in the village to serve the 14 percent of the population who are age 65 or older, and an additional 26 are located in nearby communities. 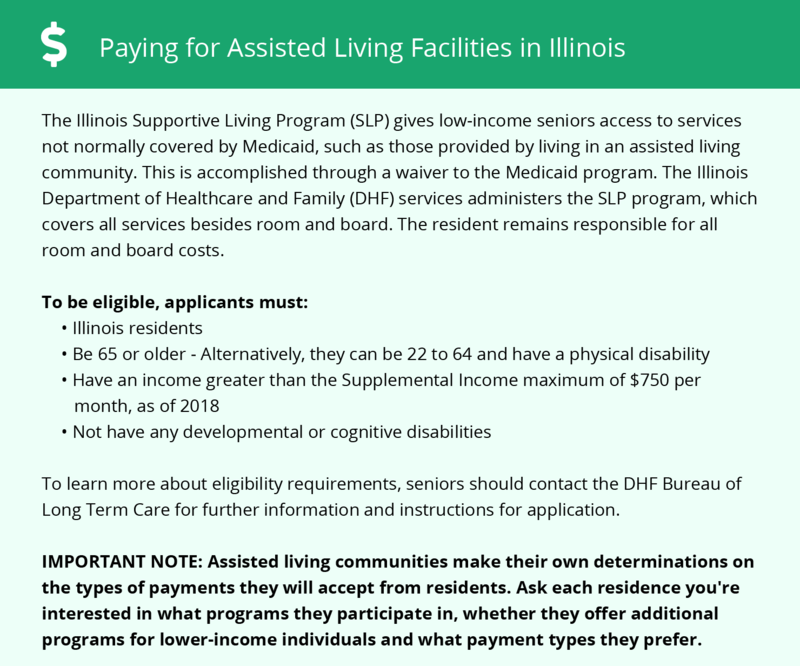 Assisted living facilities in Hinsdale, like the rest of Illinois, are required to obtain an annual license from the Illinois Department of Public Health. They are required to meet certain staffing, safety and care requirements to ensure residents' needs are met, and each resident must get an individualized service plan. The total cost of living in Hinsdale is more than twice the national average, which may be difficult for seniors on a fixed budget. However, most of that is due to high housing costs, which may not affect assisted living as noticeably. Groceries and health-related costs are lower than both the Illinois and U.S. average. The Hinsdale area is home to world-class medical facilities, including AMITA Health Adventist Medical Center Hinsdale, in the event of medical emergencies or illness. Hinsdale has excellent public transportation, which makes it easy for seniors to travel. Three Metra rail depots connect it with downtown Chicago, and Pace Bus offers routes in Hinsdale and surrounding suburbs. Seniors are eligible for discounted bus and train tickets. Hinsdale has a fairly moderate climate for most of the year, although winters can be harsh. Summer highs are typically in the mid-80s, while winter lows drop down into the teens. The area receives an average of 31 inches of snow a year, which may make it difficult for seniors to walk and drive. The crime rate in Hinsdale is very low, which makes it a generally safe place to retire. The total rate is 72 percent lower than the Illinois average and 75 percent lower than the U.S. average. Most crime in the area is non-violent property crime. Hinsdale is located in Cook and DuPage counties, both of which have been given an F rating for air quality by the American Lung Association. Seniors with respiratory health issues may need to take extra precautions. Assisted Living costs in Hinsdale start around $4,750 per month on average, while the nationwide average cost of assisted living is $4,000 per month, according to the latest figures from Genworth’s Cost of Care Survey. It’s important to note that assisted living rates in Hinsdale and the surrounding suburbs can vary widely based on factors such as location, the level of care needed, apartment size and the types of amenities offered at each community. Seniors who receive Medicaid may qualify for the Supportive Living Program waiver, which helps extend Medicaid coverage to assisted living services. Illinois also offers the Community Care Program, which provides similar assistance. Hinsdale and the surrounding area are home to numerous government agencies and non-profit organizations offering help for seniors searching for or currently residing in an assisted living community. These organizations can also provide assistance in a number of other eldercare services such as geriatric care management, elder law advice, estate planning, finding home care and health and wellness programs. To see a list of free assisted living resources in Hinsdale, please visit our Assisted Living in Illinois page. Hinsdale-area assisted living communities must adhere to the comprehensive set of state laws and regulations that all assisted living communities in Illinois are required to follow. Visit our Assisted Living in Illinois page for more information about these laws.